Prog visionary Steve Hackett has announced the addition of multi-talented guitarist Roine Stolt to his tour line-up. Stolt, known as leading light of the Flower Kings and for his association with Transatlantic, will play bass and twelve string, occasionally also joining Steve on guitar. Hackett, who releases new album Wolflight on 30th March, will bring his Acolyte To Wolflight with Genesis Revisited Tour to the UK in October 2015 with 19 shows. Each performance will feature two sets, one of solo material and one of Genesis Revisited. The first will cover a vast part of Steve’s discography, with a selection of solo material from early albums including Voyage of the Acolyte & Please Don’t Touch right up to Wolflight; the second set will see Nad Sylvan take care of the vocals on the Genesis material. 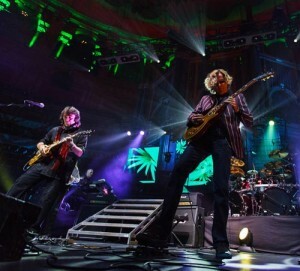 The complete line-up for the tour will include Roger King on keyboards, Gary O’Toole on drums, Rob Townsend on sax, Roine Stolt on bass & 12 string guitar, Nad Sylvan on vocals and Steve Hackett on guitar and vocals. Vocalist/guitarist Amanda Lehmann will join some of the shows as special guest. Wolflight is Steve’s first original album since ‘Beyond The Shrouded Horizon’ in 2011 and takes the listener through an imaginary journey through time and space on the eternal quest for freedom. The legendary guitarist is looking forward to bringing this latest chapter of his career on stage while re-living his musical evolution with his loyal fan base. For tickets, see The Ticket Factory.